If you have diabetes – especially if it’s not controlled – your risk of many types of eye disease is greatly increased. You may be familiar with the term “diabetic eye disease”. Rather than being a specific condition, this term refers to a whole group of conditions that could affect people with any type of diabetes, including type 1, type 2 and gestational diabetes. These conditions include cataracts, diabetic macular edema (DME), and diabetic retinopathy. All forms of these ocular diseases can lead to vision loss and blindness. All of the conditions that comprise diabetic eye disease can begin and progress for a while without presenting symptoms. Once you notice symptoms, such as vision loss, it indicates that the disease has advanced. At this late stage, treatment is more complex and generally less effective. That’s why all people with diabetes should schedule an eye exam at least once a year! At YESnick Vision Center, we perform thorough, dilated eye examinations to detect and monitor in your vision and eye health. We will inspect closely for any changes to retinal blood vessels, inflammation, changes in your lens, and nerve damage. Our Las Vegas team and office is up-to-date with all the latest diagnostic technology, and Dr. Yesnick will keep close watch on the effects of diabetes on your eyes. Book your yearly Diabetic Eye Exam today! Early detection, prompt treatment and responsible follow-up care of diabetic eye disease can prevent or delay vision loss. In addition, controlling your diabetes by keeping blood sugar levels within the parameters recommended by your physician goes far towards keeping your eyes healthy. For more information on how to care for your eyes with diabetes, please schedule an appointment with Dr. Yesnick, your compassionate and highly experienced optometrist in Las Vegas. Among people with diabetes, diabetic retinopathy is the most common cause of vision loss and visual impairments, such as Low Vision. Chronically high blood glucose can damage the delicate blood vessels in your retina and can cause bleeding or fluid leakage, which may distort vision. The longer a person has diabetes and the poorer the level of control, the greater the risk of diabetic retinopathy. There are different stages of diabetic retinopathy, beginning with nonproliferative retinopathy and advancing to proliferative retinopathy. In the early stages of nonproliferative retinopathy, you may not experience any symptoms, or you may notice new floaters (due to bleeding). In the most advanced stage, new abnormal blood vessels increase in quantity on the retinal surface, which causes more bleeding, leaking, retinal cell loss, and scarring that raises the risk of retinal detachment. Nowadays, there is a range of medical therapies to treat diabetic retinopathy. Dr.Yesnick will evaluate and monitor your condition closely to recommend the most appropriate, helpful treatment. Common treatments for proliferative diabetic retinopathy include scatter laser surgery or a vitrectomy, and we will refer you to a first-rate eye surgeon to perform these procedure. In the comfort of our Las Vegas office, Dr. Yesnick will provide full preoperative and postoperative co-management for your eye surgery, and he will continue to manage your condition. If you suffer vision loss from diabetic retinopathy, we will recommend visual aids and design personalized rehabilitation to promote your independence. As the leading Low Vision experts in Las Vegas, we have many ways to help you maximize your remaining vision for a high quality of life! This condition is typically a consequence of diabetic retinopathy and describes swelling in the macula, which is the central area of your retina. It affects your ability to see straight-ahead and to focus on fine details; patients with DME often experience blurry vision. DME occurs in approximately half of all people diagnosed with diabetic retinopathy, and it is most likely to occur as diabetic retinopathy gets worse. DME may be treated with a variety of different therapies. Injection therapy to block and reverse the development of abnormal blood vessels and decrease fluid build-up is one medical approach. Laser surgery and corticosteroids are two alternative treatments. Adults with diabetes are more prone to cataracts, which refer to a clouding of the ocular lens. 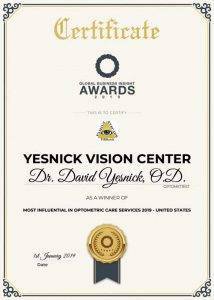 If cataract surgery is needed, Dr. Yesnick will co-manage your procedure and provide total follow-up eye care services. Controlling blood sugar levels offers potent protection for people with diabetes to protect their eyes. Blood pressure and cholesterol levels must also be kept within recommended guidelines. 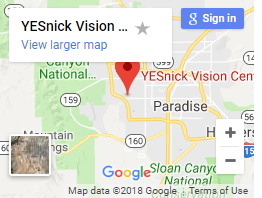 At YESnick Vision Center in Las Vegas we can help you with other eye conditions, such as Macular Degeneration or Computer Vision Syndrome. Computer Vision Syndrome is a relatively new aspect of modern eye care but our optometrist knows how to help you. Regular, annual eye exams in our Las Vegas optometry practice will also protect you against vision loss or blindness due to diabetic eye disease! If you have diabetes, contact us today to reserve an appointment.